If you think a truck called the “Ram Power Wagon” would be some burly, brutish conveyance … you’d be absolutely right. 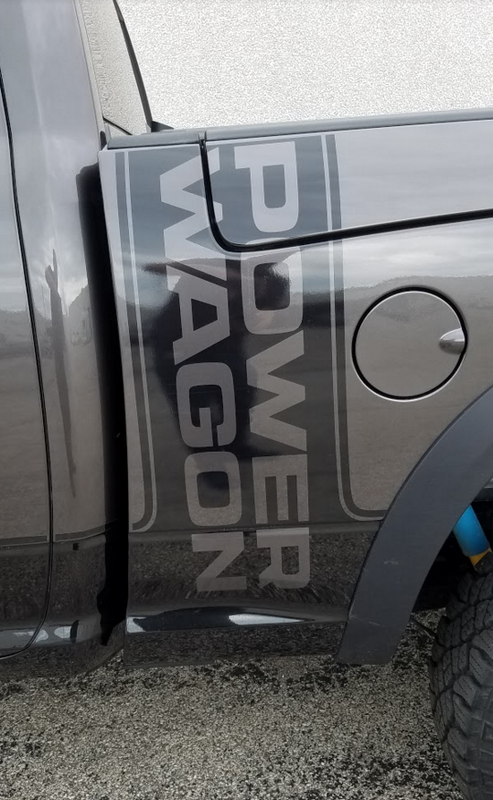 The ultra-macho Power Wagon graphics are subdued a bit by the “Granite Crystal” paint. 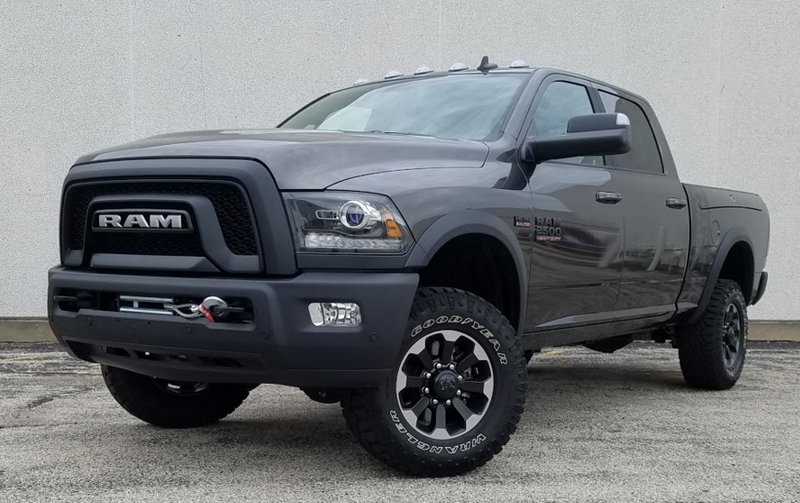 In fact, the Power Wagon Crew Cab that hit our lot was almost cartoonish in appearance, with the Ram’s normally aggressive look amplified by a jacked-up ride height (Ram says a total of 14.3 inches of ground clearance) and meaty 33-inch off-road tires. 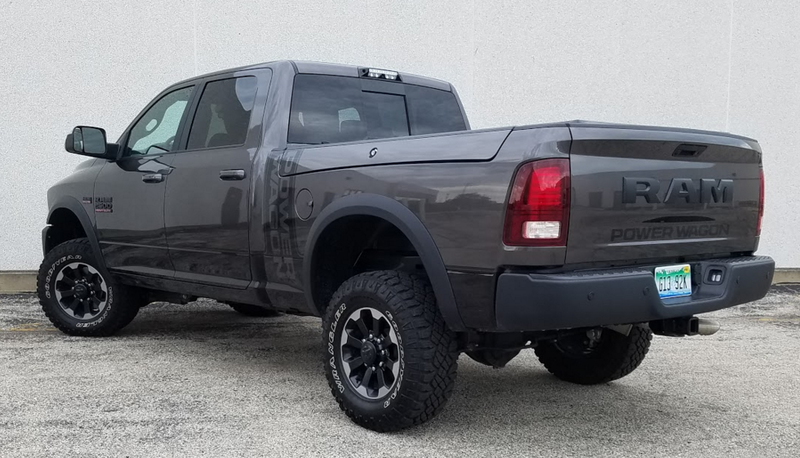 And this was with its dark grey paint nearly masking the big, vertically oriented “POWER WAGON” decals at the leading edges of the bed that – if more visible – would have added an even more macho attitude. Since the Power Wagon is aimed at off-roading, it includes numerous features that assist in that pursuit. Standard in this model are a front-stabilizer-bar disconnect, 12,000-lb. front winch, hill descent control, locking front and rear axles, and fuel tank/transfer case skid plates. As our test truck had been used for the type of off-road work for which it was intended, it had no running boards (which can get “high centered” over crests), making getting in and out a challenging — and occasionally, rather comical — affair. If it weren’t for the huge grab handles mounted to the front and side pillars that allowed you to pull yourself up, I might have been forced to carry a step stool. Once inside, things got better. The rather impressively outfitted interior (leather upholstery, nice trim, and lots of deeply padded surfaces) contrasted sharply with the vinyl floor mat, but the last is probably just the ticket for hosing the beast out after an off-road excursion. There’s plenty of room front and rear for large folks, and the cabin hosts more storage space than some places I’ve lived. This includes a handy dash-top bin, storage boxes beneath the rear-seat floor, and large storage compartments under the rear seat cushion, with a “deck” that folds out to make a level floor platform. However – and rather oddly – the rear seat backs didn’t fold down, something that was noticed when I opened the power-sliding rear window to accommodate some 10-foot boards, and the seat back blocked the lower edge of the opening. The Power Wagon’s raised suspension and huge off-road tires result in 14.3 inches of ground clearance — and a really tall step up into the interior. Also, our Power Wagon was fitted with a center front-seat cushion and backrest for 6-passenger capacity, though the cushions greatly reduced center-console space, and anyone riding there would have virtually zero foot room. Our tester also featured adjustable pedals (a $195 option), which are particularly beneficial to shorter folks. 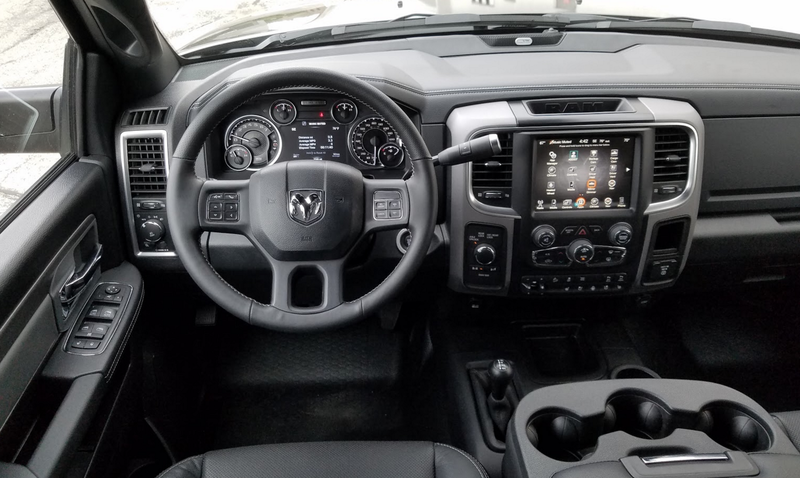 Niceties added in the $4995 Power Wagon Package included the aforementioned leather upholstery, 10-way power driver seat with memory, heated and ventilated front seats, heated steering wheel, and 115-volt power outlet. 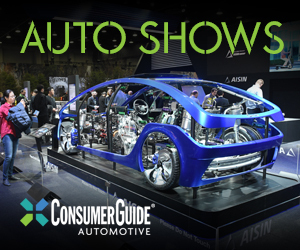 Also fitted was Chrysler’s Uconnect infotainment interface with navigation, 8.4-inch screen, and traffic information ($500) that’s among the most usable on the market today, though some controls – including those for the climate system – can be a bit of a stretch to reach. The rubber floor covering seems out of place beneath the otherwise nice materials and trim, but it probably suits the Power Wagon’s off-road purpose. Although today’s pickups are less about sheer cargo-carrying capability than those of yore, the Power Wagon had its share of useful features aimed toward that end. 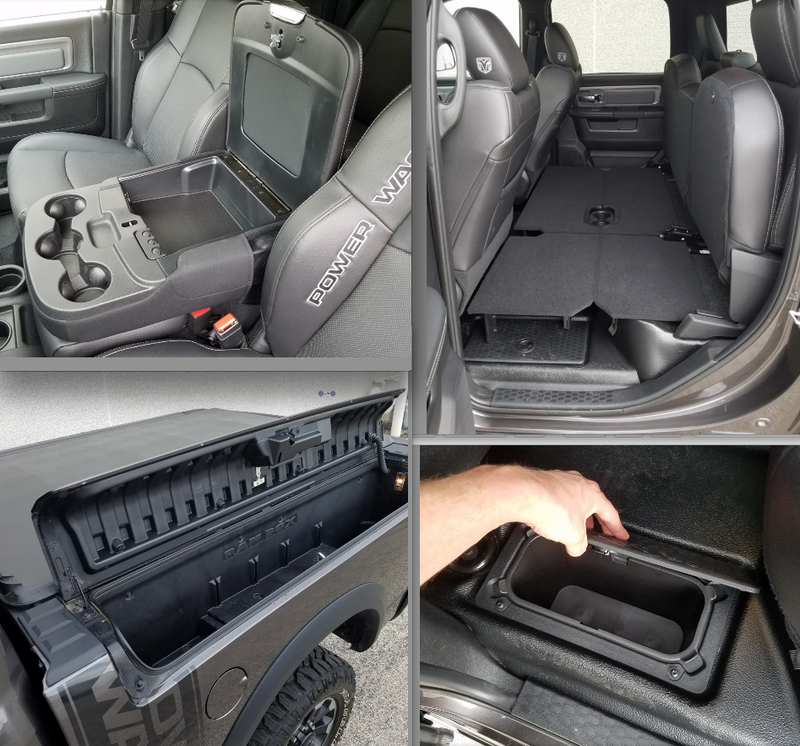 Included in the $1295 RamBox Cargo Management System are RamBox covered/locking sidewall bins (naturally), adjustable tie-down hooks, a bed cargo divider/extender, and bed lighting. Other related options included a cargo-area camera ($345), tri-fold tonneau cover ($545), and a spray-in bed liner ($495). Clockwise from top left: What looks like an unusually shallow console box is actually the back of a middle front seat when folded up. In back, raising the seat cushion reveals a storage bin with a fold-out platform, and there are also small bins in the floor. The RamBox makes for handy exterior storage. Despite its obvious off-road focus, the big Ram rode fairly well. Sure, it was jittery over small bumps but not violently so, and bigger bumps were quite well absorbed. A long highway trip was often jiggly but never punishing, despite a rather high level of tire noise. This is particularly noteworthy for a ¾-ton pickup (which the Power Wagon is), and can at least partially be attributed to the fact that these Ram models are fitted with the coil-spring rear suspension that has so impressed us in the ½-ton versions. (All other full-size pickups have rear leaf springs.) However, note that the Power Wagon’s huge size and high front fenders (which tend to hide mere mortal vehicles beside you) conspire with visibility restricted by thick roof pillars and tall side sills to make parking in traditional spaces a risky proposition – at least, for everyone else …. 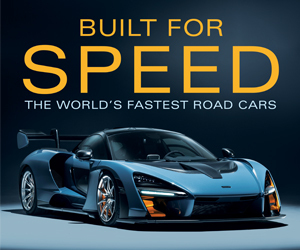 Although flooring the throttle connected to the big 6.4-liter, 410-horsepower Hemi V8 results in a fairly strong jump from a stop, the hefty weight, poor aerodynamics, and the rolling resistance of those wide tires combine to make highway merging and passing more of a chore. And none of that does much for fuel economy, either, as I averaged just 12.3 mpg in 75-percent highway driving. Certainly the Power Wagon is absurd for everyday driving – unless your drive includes some really, REALLY rough going. But it’s equally certain that the Power Wagon makes a strong statement, and for some, that’s what owning a big pickup is all about. Subtle, it ain’t. But the Ram Power Wagon proved itself more livable than might be expected of such a huge, off-road-oriented vehicle … though running-board steps would have made it a whole lot easier to enjoy. Written by: The Daily Drive staff on July 18, 2017.on February 1, 2019.